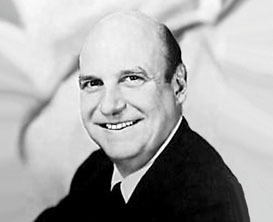 Jackie Coogan (1914-1984), born in Los Angeles, California is recognized as the movies� first major child star. He first appeared on screen in the 1917 feature Skinner�s Baby, then in the 1919 short A Day�s Pleasure. He was a natural mimic and became a major star with the February 6, 1921 First National feature 'The Kid'. 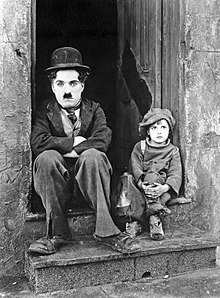 Charlie Chaplin wrote, produced, directed and starred in the film story of Chaplin�s tramp character rescuing the orphaned Coogan. Coogan was famous for his pageboy haircut and his The Kid outfit of oversize overalls and cap, which was widely imitated, including by the young Scotty Beckett in the Our Gang films. He was also one of the first stars to be heavily merchandised, with peanut butter, stationery, whistles, dolls, records, and figurines just a sample of Coogan merchandise that was offered. Other notable Coogan films of the 1920s and 1930s include Peck�s Bad Boy 1921, Circus Days as Toby Tyler in 1923, Tom Sawyer 1930, Huckleberry Finn 1931. He was married to Betty Grable from 1937 to 1939 and they both appeared in the 1939 feature Million Dollar Legs. On May 4, 1935, Coogan was the sole survivor of a car crash in San Diego County that claimed the life of his father, and his best friend Junior Durkin, a child actor best known as Huckleberry Finn in two films of the early 1930s. The accident took place just short of Coogan's twenty-first birthday. The legal battle did, however, bring attention to child actors and resulted in the state of California enacting the California Child Actor's Bill, sometimes known as the Coogan Bill or the Coogan Act. This requires that the child's employer set aside 15% of the child's earnings in a trust, and codifies such issues as schooling, work hours and time-off. Jackie's mother and stepfather attempted to soften the situation by pointing out that the child was having fun and thought he was playing. However, virtually every child star from Baby Peggy on has stated that they were keenly aware that what they were doing was work. He served in the Army in WWII, then returned to acting in films and the new medium of television. Coogan enlisted in the United States Army in March 1941. After the attack on Pearl Harbor, he requested a transfer to United States Army Air Forces as a glider pilot because of his civilian flying experience. After graduating from glider school, he was made a flight officer and he volunteered for hazardous duty with the 1st Air Commando Group. In December 1943, the unit was sent to India. He flew British troops, the Chindits, under General Orde Wingate on March 5, 1944, landing them at night in a small jungle clearing 100 miles behind Japanese lines in the Burma campaign. After the war he then returned to acting in films and the new medium of television. Fame once again came to Jackie Coogan in the form of The Addams Family TV show. Based on the macabre New Yorker cartoons of Charles Addams, the series aired from September 18, 1964 until April 8, 1966. Coogan played Uncle Fester Frump in 35 episodes. He wore a fur coat, was bald and sadistic and capable of conducting electricity. He was the voice of the same character in the spin-off Hanna-Barbera cartoon series in 1973-1974. His last film was The Escape Artist in 1982. Coogan has a star on the Hollywood Walk of Fame in front of 1654 Vine Street, just south of Hollywood Boulevard. On March 1, 1984, Coogan died of cardiac arrest at the age of 69 at Santa Monica Medical Center in Santa Monica, California. He was buried in Culver City's Holy Cross Cemetery.